Bluegrass Pundit: Hugo Chavez said about Obama, "we have to help him." Hugo Chavez said about Obama, "we have to help him." Marxist dictator Hugo Chavez of Venezuela was in Venice for the world premiere of "South of the Border." 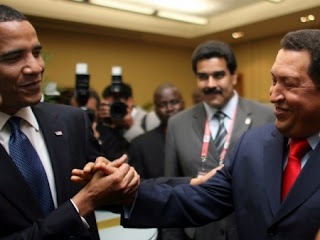 Hugo Chavez once called former President Bush "the devil," but he just loves President Obama. About Obama, Chavez said, "he has good intentions and we have to help him." Help him do what? Turn America into a Marxist state like Venezuela?